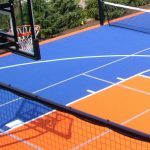 Multi-Sport or single or double courts we completely customize and create eye-catching, highly functional, state of the art courts. At MBS we focus on your goals and budget and carefully design and build not just a tennis court but an overall great tennis experience. Our team of experts has decades of experience and we bring you the most up to date options for all court users. MBS also specializes in converting and enhancing existing tennis courts into multisport courts (such as tennis and basketball in one) so space is better utilized for players of all ages at home, at school or at the local community center or park. MBS specializes in not just single courts but sunken tennis courts and large banks of tennis courts. The intricacies of each court are planned out and reviewed well in advance and we work as a team to ensure that each spec meets your needs, budget and desired vision. It’s the project planning and attention to detail that is our hallmark of success. WE DO TENNIS NEW CONSTRUCTION, PATCHING, AND COURT OVERLAYS. We install Versacourt indoor and outdoor products. We also specialize in NGI Spot surfaces products. These are the most innovative flooring system on the market today. Perfect for multi-sport uses, indoor or outdoor, this durable all-weather material will provide the ultimate sports experience. There are many options to build courts today as well as to protect them immediately after they are built with our special court sports surfaces and shield and tile solutions. We specialize in all of these options helping to maintain and repair courts cost-effectively so in the future courts do not need to be rebuilt. We also build courts that are double use, basketball and tennis. Was looking for a service to have our driveway painted with foul lines and came across My Backyard Sports. The whole process was easy. Price was quoted, appointment scheduled, they called to confirm the appointment then called after to make sure we were happy with the work. Kids love it. Great experience. I highly recommend this company. The whole team at Backyard sports was awesome, they made the design process a breeze. 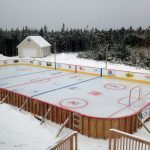 Now I have an amazing back yard basketball court!